These birds, like all species of hornbill, have distinctively large, down-curved bills that they use to grab small animals from among the grasses and shrubs of their habitats. They can fly, but spend most of their time on the ground. Males and females differ in size and coloration, with females displaying bright-blue throat patches. 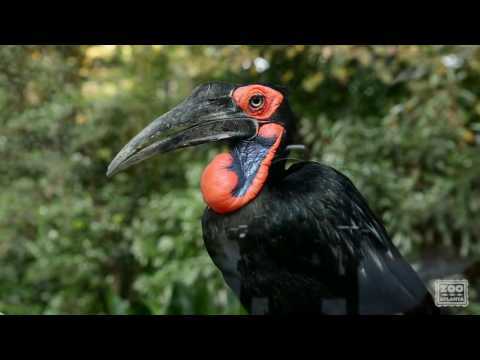 The southern ground hornbill’s low-pitched booming sound is a simple territorial announcement. The southern ground hornbills may be seen at virtually any time. Our pair is very interactive and enjoys showing off for guests. These birds are formidable predators on any small animal or large insect. A few strikes or shakes of the massive bill will kill their prey, including venomous snakes, very quickly. Their powerful feet allow not only for fast locomotion across rough terrain, but also for kicking or grabbing prey items. Hornbills use a method called ballistic transport to secure their prey, with the first prey secured and killed by the tip of the bird’s bill. The item is then released by the opening of the bill, and the bird thrusts its head forward to position the prey in its throat. In their small social groups, dominant males typically earn the rights to most breeding, but all members of the group cooperate to raise the offspring. Nests are typically located in trees, with one to two eggs laid. Incubation lasts about 40 days, and chicks fledge when they are 80 to 90 days old. Female chicks leave the group after about two years, while young males may remain for around 10 years. This species ranges across the drier areas of Central Africa, such as Kenya and Zaire, and southward to Botswana and South Africa. Southern ground hornbills run or walk among thin grasses and various thorn scrub habitats, visually searching for any small animal or nest as prey. In the wild, prey can include rodents, snakes, lizards, frogs, bird eggs, nestling birds and insects. At the Zoo, the ground hornbills are offered crickets, mealworms, chicks and mice. To give them plenty of sensory input to discover and manipulate, the southern ground hornbills at Zoo Atlanta get a wide variety of enrichment items. Favorites include large plastic drums that they can peck with their bills to make great booming sounds and to manipulate the soft plastic. They also love toys with mirrors and sound-making buttons. All such items are explored with the bill, pecked, battered, pounded to produce sounds, and tossed about. We also present them with large objects made of braided fire-hose that have food items hidden beneath the braids. The hornbills will spend hours flipping the objects around and probing the braids to find the hidden treats.